I am very sentimental about this book. This is the first book by Iain Rob Wright that I ever read a few years back. I was drawn to the “overstressed – almost ready to crack cop who was given a free cruise by his department to get his head together or else” premise. I am also intrigued by Titanic and ship disasters in general and then throw in zombies and a supernatural force causing the day to “reset” in hopes of preventing the apocalypse? My first read through in 2013 was a rollercoaster of late night under the covers with a (non backlight kindle) suspense. Revisiting this tale almost two years later after familiarizing myself with what whas fast become one of my favourite authors was definitely a treat! This book falls approximately halfway through what IRW calls the “Damien-Verse”, which is a series of loosely related stores involving a common street thug named Damien Banks and an incredibly rich and extremely “disturbed” child named Samuel Raymeady. While this book is part of a series, it can still be read as a stand alone novel without any gaps in the story. Reading it again after filling in some of the blanks however has made a good story even better. 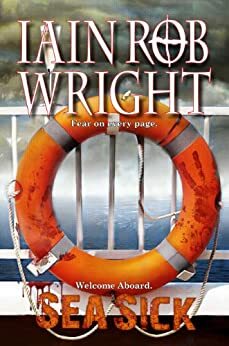 Yes,this is just another “zombie apocalypse” novel but aside from “Titanic with Zombies” is still pretty unique. Throw in the whole “Groundhog day” aspect and you have a really good read!